set of core standards for K-12 in English language arts and mathematics. On June 2, the Common Core State Standards were released. These standards provide consistent framework to prepare students for success in college and/or the 21st century workplace. Unpacked Standards - The "unpacked" documents on this site gives what students should know, understand and be able to do for each grade level standard. matched to student needs. 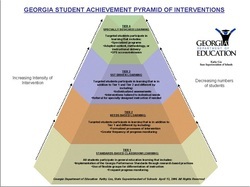 Your child's classroom teacher can share with you the RtI process in more detail. Please see the RtI Parent Brochure.